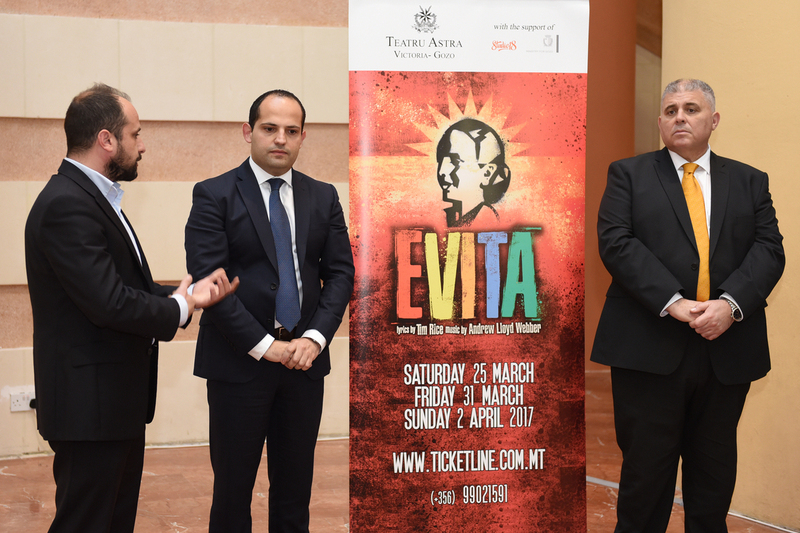 Teatru Astra has announced further details about its forthcoming musical Evita, including an added third show on Sunday 2 April - following unprecedented demand for tickets - underlining the local audience's keen interest in Andrew Lloyd Webber's acclaimed musical, which has topped box-offices since it was first produced in in the late 1970s. The cast line-up and the additional matinee performance of Sunday 2 April - in addition to the scheduled productions of the 25 and 31 March were announced during a press conference held at St James Cavalier in Valletta on Tuesday 21 February in the presence of the Hon Dr Anton Refalo, Minister for Gozo and Mro Sigmund Mifsud - musical director, Christopher Gatt and Jean-Gafa' - artistic directors and Michael Formosa, chairman of the organising committee at Teatru Astra. Dr Anton Refalo, stated that the production of high quality artistic events are an investment for the island which in the last months has seen a record number of people crossing over to Gozo. He pointed out that Teatru Astra, has been at the forefront in making Gozo a destination of excellence through its high quality productions, including its annual opera, RockAstra and, since last year, the successful production of a musical. He concluded by congratulating the organisers and cast and recognising the voluntary element underpinning this musical. Mro Sigmund Mifsud, who is leading the second musical at Teatru Astra, following last year's production of Grease highlighted the opportunities Teatru Astra is providing to performers who are into musical theatre. He recognised the efforts undertaken by Teatru Astra to house productions which echo the West-End and Broadway. Evita, which employs a wide spectrum of musical styles, will feature a formidable line up spearheaded by Cathy Lawlor in the title role of Evita together with Edward Mercieca in the shoes of Peron and Joseph Zammit who will be interpreting Che. 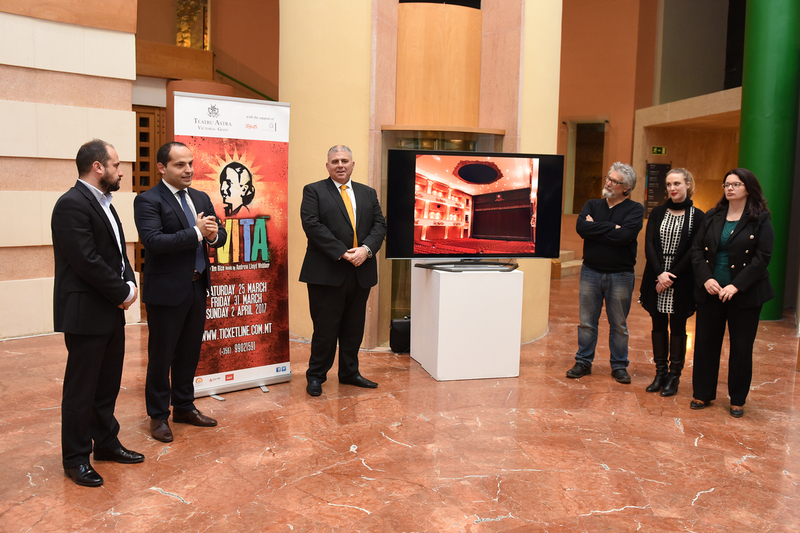 Michael Formosa, Administrative Secretary at Teatru Astra, stated that the organising committee is encouraged by the marked interest in this production. Formosa reiterated that producing Evita underscores Teatru Astra's role as a catalyst in the local artistic scene. He spoke of the theatre's electrifying experience since its venture into musicals, which has also led to the formation of the Astra School of Musical Theatre - a professionally run academy which aims to train young people in drama, dancing and singing. Formosa thanked the Ministry for Gozo and the other corporate sponsors for the support towards the production of this year's musical - a production which will enrich the artistic community and well as provide an economic incentive to the local commercial community. Following last year's positive experience in producing Grease, theatre director Chris Gatt is looking forward to this latest challenge. Teatru Astra, he said, is an ideal setting for a production as epic as Evita. Gatt was also thrilled that this year's musical will be able to take advantage of the theatre's operatic heritage, with the use of large scale choruses. He concluded that once again he is impressed by the dedication and enthusiasm of the whole Astra team, and added that and the addition of an extremely experienced Trio of Edward Mercieca, Cathy Lawlor and Joseph Zammit headlining the musical is in itself a guarantee of a great night out. Evita, a production of Teatru Astra and Ghaqda Armar Festa San Gorg, with the support of Studio 18 and the Ministry for Gozo, will be staged in Victoria Gozo on Saturday 25 March, Friday 31 March at 20.00hrs and Sunday 2 April at 15.30hrs. Other partners supporting EVITA are the Victoria Local Council, Gozo Cultural Council, the Parliamentary Secretariat for Rights of Persons with Disability and Active Ageing, General Softdrinks, Quaint Boutique Hotels and Izibet.